Official TWRP for Xiaomi Mi 5 and Redmi 4x is released now. 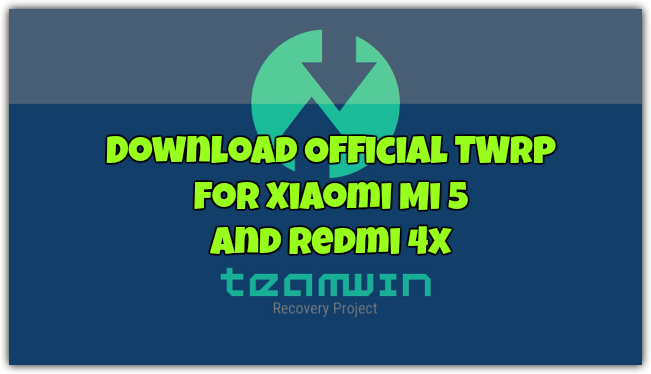 If you are the Xiaomi Mi 5 and Redmi 4x Android phone user and already using the Unofficial TWRP custom recovery on your phone, then you can now install this Official TWRP on your phone. The official TWRP are alway the best, and you will get the latest updates and fixes on this recovery. With the help of Custom Recovery, you install custom ROM on your phone and flash lots of other Mods on the phone. The best part of the TWRP is that you can take system or nandroid backup of the phone. Which is the life saver for every rooted phone users, suppose in future during some installation your phone got bricked and stuck on the boot loop. Then you can quickly restore the previous backup on your phone with the help of TWRP recovery. To install the TWRP on your Android phone first you need to Unlock the bootloader of your phone. You can use the MI Unlock Tool to Unlock the Bootloader on Xiaomi phones. From the below mention link you can download the TWRP recovery for your phone. All you have to flash this file on your phone and after that you can enjoy the feature of Offical TWRP custom Recovery. If you are the Rooted user with Unofficial TWRP recovery. Then save the TWRP image on your phone. After that boot your phone in the TWRP recovery mode. And Tap on the install option. Now, the default mode is to flash zip files; you will need to toggle the mode to images. Tap on the Images button on the bottom-right of the screen. And now select the TWRP file and Flash it on your phone. This will update the TWRP recovery on your phone. If you are non-rooted user and want to install the TWRP recovery first time on your phone. Then unlock the bootloader of your phone first. After that follow this tutorial to flash the TWRP recovery image on your Xiaomi Mi 5 and Redmi 4x. So with this simple guide, you can quickly update TWRP on your phone or install the TWRP custom Recovery on your phone. During the process, if you face some kind oof problem or getting some error. Then do contact us, just leave a comment below.